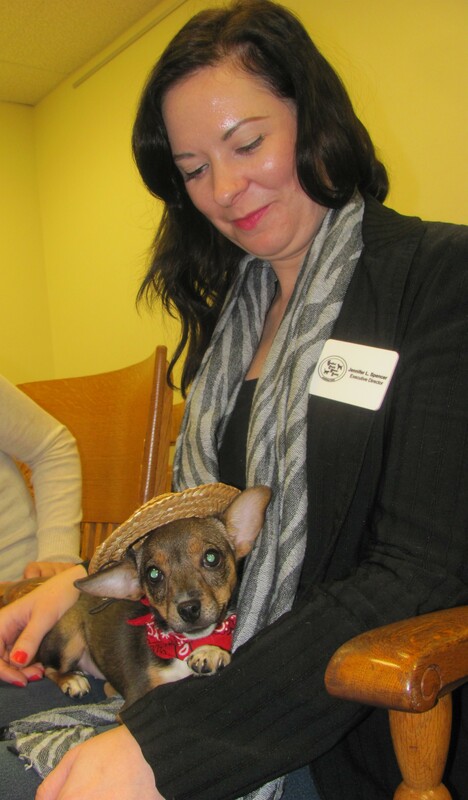 Bradford County Humane Society Executive Director Jennifer Spencer holds a chihuahua mix pup named Penny at the Oct. 31 meeting of the Bradford County Commissioners. Expanding the number of stores involved in the Shop for Pete and Penny campaign led to an increase of more than $2,600 in monetary donations and supplies this year, according to Bradford County Humane Society (BCHS) director Jennifer Spencer. From Nov. 3 to 9, supporters of the animal shelter in Ulster were encouraged to purchase items from the agency’s wish list at any one of five locations of Tops Friendly Markets in Bradford County. The campaign culminated with an appearance by Pete, Penny and BCHS associates at the Tops Market in the Bradford Towne Plaza in Wysox Township on Nov. 9. When all was said and done, BCHS reaped $5,996 in cash and supplies for stray and abandoned dogs and cats. To see current photos of pets available for adoption, click onto http://members.petfinder.com/~PA19/.